This is one of those stories that we just can't help but take with a grain of salt, because it feels like every time Apple is releasing a new iOS device, it faces some sort of component shortage. Of course, unless you're planning to line up late on launch day, you may not notice any shortage. A new report from DigiTimes says that info from component suppliers (which DigiTimes often gets right) says that the new QXGA iPad screen (2048x1536) hasn't seen the ramp-up in production needed for the launch. LG, Samsung and Sharp are all hard at work producing the screens for Apple, but haven't been able to produce enough screens. DigiTimes goes on to predict (which is where many DigiTimes stories become unreliable) that this means the iPad 2 will continue as the "mainstream in shipments" through Q1, until iPad 3 shipments can really get going in Q2. First, of course the iPad 2 will be the "mainstream in shipments" in Q1 because Q1 runs from January through March and the iPad 3 isn't even being released until March 7th at the very earliest. For all we know, Apple will take this "shortage" into account and announce the iPad 3 on March 7th, but not release the tablet until later in March. Second, unless the report has actual numbers for production and the shortages, none of this information really means anything. We don't doubt that there is a shortage, but if it means cutting iPad 3 shipments from 10 million units to 8 million, will that really make a difference to consumers? And lastly, even if there is a shortage in stores, it doesn't mean people will suddenly flock to Android. It just means the secondary market on eBay and Craigslist will go through the roof and more casual consumers will wait a month or two. They could always repackage and conitnue selling iPad 2 since it will be the sAme ole tablet, anyway. 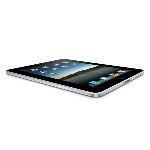 You cant make that joke about the iPad anymore since the galaxy tab 2 came out after the galaxy tab plus... just sayin. Arent we already about to start Q2? This is to be expected as when apple goes and changes everything again when re-releasing products with a new name,the ifans go out in droves and buy it like piranhas in a frenzy. The 'new' product is sold out,ifans put their names down on waiting list,the feverish desire increases with the wait and then the thrilling 'apple experience' of waiting on the product is completed. All this happens while they basically already have the exact same product already at home from last years version of the above events. Don't worry andro I'm sure you're tablet of choice will have plenty in stock. Just check the clearance bin at your local Walmart. A quarter is three months..........from January THROUGH March...........not TO March. Whoops. Small but significant mistake. Thanks for pointing that out. Wow an Apple product facing shortages?! Who would have thunk?! Isn't shortage how Apple sells their products in the first place? Create scarcity, increase desire? That is part of the plan, but really it's a matter of not wanting to have too much extra stock on hand at any given time. Last I heard, Apple had it down to where they only held 2 days worth of stock at any time to reduce waste. In other news, grass is green and water is wet. Story at 9.